Buzzsaw/C Super Carbide: Lane #1’s new Buzzsaw/C Super Carbide with it's High Load Carbide Particle Formula coverstock, rolls early, cutting through the heaviest oils lanemen have to offer. With the high flaring, dual separated mini diamond core inside this suped up cover, this ball not only rolls early, but finishes strong on the backend. Our new SUPER CARBIDE is the only ball you'll need for heavy oil..!! The Super Carbide! We drilled our ball lable leverage with the pin just above and beside the ring finger. The CG placed in the palm and no Weight hole. We took this one out for a test roll on a pair of freshly oiled lanes for a Classic Mens league that normally gets critisized for being TOO OILY! From the out set we were able to create a swing area and found that the Super Carbide cut threw the heavy oil pattern with NO Problem! The Strong arching hook provide an excellent hit and pin carry that again reassured us that this BuzzSaw was at its best! We were able to find a line to the pocket and strike with excellent consistancy! 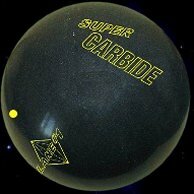 The Super Carbide is another great Lane #1. ball! and if you have a Heavy Oil problem and need to cut threw it then this ball is for you! Just to temper our results we waited until the start of the Classic League to watch some very good local bowlers struggle on the same pair of lanes with the heavy oil pattern. I approached one of the All-Star bowlers that I knew and asked him if he wanted to try my New Super Carbide the 2nd. game, and he replied, Why Not! I am already struggling with the lanes! His hand span was very close to mine so with a grip size change and a few pieces of tape in the thumb hole he was off and rolling! He started the first game with a 195 using another Agressive particle ball, then after switching to the Super Carbide he rolled games of 249 and 269 sweeping the sidepots and taking home just over $400 for the night! He came to the proshop and said he was keeping the Super Carbide for himself and wanted to pay me for it right then and there! I was impressed that this ball sold it's self!! I highly recommend this ball and encourage everyone to get this ball if you need to conquer the heavest of oil! I just recently purchased to buzz saw super. It had a 1 and 1/2 to 2 inch pin. I layed it out 5 1/2 x 5 1/2! I put the pin above my bridge and the cg just below my bridge. This ball rolls great when there is some head out there. I polished the best of the extender polish by ebonite could. That drilling for me gives a ball alot of length so I figured it would be a great drilling on the carbide super. We bowled a league today and had a nine game session. (The lanes were wood no gardian and a regular top hat pattern) The first 5 to 6 games it was a great ball to use but when the heads were burned up the ball would not get down the lane. I now have 2 carbides and 1 super carbide. If you put any hand in the ball at all I would recommend giving this ball a drilling that will get it down the lane. If you will be bowling on any of the sport condition patterns this would deffinitely be the ball to bit through all the oil. I recieved this ball from fellow contributor Brad Letts. Thanks! This ball is the quintessential buzzsaw. It is VERY arcy in nature. It has a really noticable transition down the lane. You need to play in with this ball. The deeper you are the harder it hits. I notice that it is time to move in deeper when the hit becomes like any other ball. I move and boom there is that crack of the buzzsaw. I am looking forward to the seeing the difference in the bomb and the super carbide. This ball is yet again another quality buzzsaw. Give it a try and move in to the oil more. Let me start out by saying thanks to Lane#1 for giving away some balls through this website and the tournament. Now as it turns out I got a Super Carbide instead of the Carbide Bomb that was listed on the tournament site. That may have been a mistake that I am glad happened or at least it has started that way and I am not going to sugar coate this because they gave me the ball. To start with I drilled the ball at 3 3/4" and 12:00. I wanted the ball for heavy oil, I have balls for everything else. I bowl on wood lanes and we had travel league in our house this past weekend and since we bowl two 3 game blocks with 5 man teams we added some more oil to our house pattern. Which is 43ft and the lightest condition on the lane is over 4 or 5 units. We still beefed it up more with a second tree over the first and ran that pattern out to 30ft. What I managed to do was roll 725 & 689 and only missed one spare out of those 6 games. The reason was the controlable read I was able to generate and therefore left very makeable spares. Oh, and this thing really opened up the lanes. I have a natural 45 axis, have fairly high ball spead and revolutions. I was standing between 28 and 30 rolling 17 to 19 to as far out as I wanted to go. Best line seemed on those days to be 18 to 7 with a big arc and watch'em fly. Talk about destroying the rack. I had guys I was bowling against wanting to know if this thing was legal. So far the ball is all I had hoped. The real test will come this next weekend as the ball sees its first regional condition. I do know there is a time to put the ball up. I mean it is not a dry lane ball and the way I drilled it, I won't use it on medium conditions either. But if looking for something for oil, give this one some serious consideration. I Like this ball so much I got 2 of them drilled differently. 1st ball: 3in pin 3.5 top, label drilling with pin at 2 O'clock. 2nd ball: 3in pin 3.5 top, Max leveraged drilling for early roll. I use these combinations for heavy oil and I get a nice smooth roll to pocket with and last second move. Both balls have the about same move I just move the the less aggressive one with the aggressive starts to come in a tad much. I have been using these 2 balls for about 3 months and both are still moving like new, but then I don't use them very often. Had to follow up my original review. I went back to 16's in September so the ball has not had a lot of action recently. However, ran in to a condition at travel league this weekend that the ball really surprised me. Day one I was using 16's and leaving every solid single you can imagine. To make things worse a hold area quickly developed just outside the pocket that was not letting you swing the ball out much. Now add this to a pattern that was at most 38ft and you had a big over/under develop. Using everything else in my arsenal and nothing allowed me to master this condition. So, on day 2 I brought the Super Carbide along. Well I did not shoot any honor scores, but the ball allowed me to use different hand positions and axis to create a better carry percentage and generate 5 out of 6 games over 200. Day one I only shot one 200 and several we don't want to mention. I did this for all six games on old wood lanes. I would have never believed the ball would have been usable on shorter, medium or worn conditions, but it worked great and the last two games were 232,222. I think I am going to add a 16 lb. version of this ball to my arsenal for the long wetter conditions and I will not leave this one at home again. My SC is 16#, has a pin out of 4"-5", pin drilled 4 1/4" from my PAP, CG is reltively close to the centerline. It also has 3.5 oz of top weight. I plugged and redrilled my Super Carbide and went with a CG out type pattern, which is different from the original above. It is now laid out 4x2 (pin next to ring) and rolls beautifully like it should. It rolls the entire lane if I come up the back, or has a massive backend if thrown with a low track. It destroys all pins on every pocket hit, carrying the world with it. Messengers get sent to the four corners of the lane, and pins run in fear when this ball hits. There is no oil pattern that can control this ball, which is why it spends alot of time in my closet and not on the lanes. Unless you like playing on the left gutter I wouldn't advise using this Saw on a house shot unless it's flat. The best condition I've used the Super Carbide on was a reverse block type pattern. This ball can cut right through the juice like a hot knife through butter. Usually in those cases my line of play is ten to five, and I use srtictly a high track to get the ball in a roll sooner. I shoot well with this ball whenever I can use it and wish I could throw it more. Since it's new face, the ball flairs roughly 85% of the circumference, which is why I've deemed it a tourny ball only. Terrific ball, sorry to see it discontinued. I got this ball for free. I work at a bowling alley and the alleys damaged it ouside of the track and the guy wanted it replaced. So i fixed the ball and changed the span and so i got basically a new ball. 15# 2" pin drilled with the pin below the ring finger and cg stacked below that. This is the first lane one ball i have thrown and am not impressed. Maybe i was expecting too much out of a ball that costs $200 but for a ball that costs as much as my car payment, i think i will continue to make my car payments and get other midpriced stuff. Speaking of the spirit, i will compare the buzzsaw to my spirit, which again costs about an 1/4 the price. Hook - the spirit covers more boards in total hook, more length and more backend. Control - The spirit goes longer, recovers stronger, and hits a lot harder. The buzzsaw is squirty a lot of times, going high some and skidding other. Versatility - I can only play down and in only with the buzzsaw. This ball hast to be going toward the pocket to hit the pocket. I doesnt recover if you try to swing it. But I can play anywhere from down in with the spirit to the infamous infront of the ball return monster swing. Spirit is also less oil sensative. This ball was a real lame1 just like its pearl counterpart. I just heard a wild rumor that Richie from Lane 1 is sueing the USBC for ten million dollars for making the 2002 Super Carbide Bomb illegel to use. Page created in 0.762 seconds with 22 queries.